Informative essay always consists of the data which comes from highly reliable sources. This type of essay should be written in a consistent, structured, coherent, and constructive manner. Informative articles are not about providing your personal points of view and emotional reactions; they’re about the information itself. It should be presented in an estranged manner, free from third-party perceptions, and comments. Similarly to other essays, an informative essay consists of three obligatory components – introduction, main body and conclusion. When writing an informative piece of writing, always focus on details and utilize formal structure. 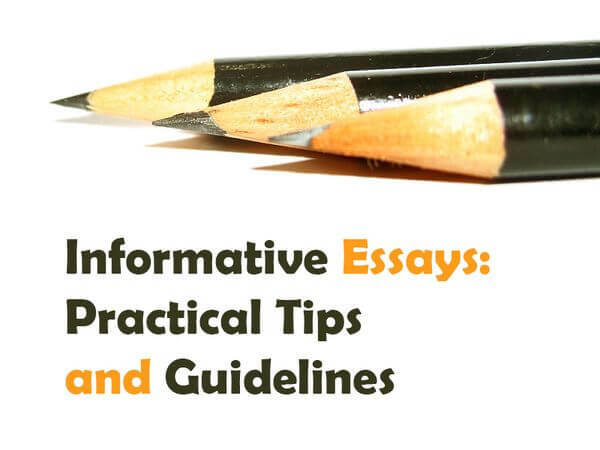 In order to be more effective, informative essays are sometimes combined with other kinds of essays (for instance description essays or narrative essays). 1.Introduction. Can you imagine a book without introduction? Same goes to essays. The introduction reveals why the author chose this particular topic, why it is important and why readers should care about reading this article. It must be written in a way that grabs the attention of the audience right away and creates the strong desire to read the whole paper. 3. Conclusion. This part sums up the whole essay. Nevertheless, it shouldn’t consist of recitation from the main body, but should be an accurate and impressive summary of the whole paper. The author should put together a message that won’t leave any person indifferent. It’s much like the end of the movie – it should be epic. Nobody likes movies with boring endings. Never forget the 5 “W”s of informative writing. Your essay should answer five basic questions – What? When? Where? Why? Who? Offer solutions – it will be very useful both for you and your audience to provide some recommendations on the options you have analyzed. If you offer solutions, your essay will have value. May all of your informative essays be well-written and successful!